Published by P.S. 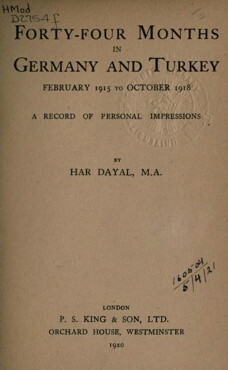 King & Son in 1920, Forty-Four Months in Germany and Turkey records Har Dayal's impressions of the two nations. Throughout the book, Dayal criticizes German nationalism: "Some Americans defended slavery on the ground that the negroes really belonged to a different species, and could therefore be treated like animals. The Germans look upon all other nations, European and Oriental, in much the same way." Dayal is equally critical towards Turkey, writing that "the Turks, as a nation, are utterly unfit to assume leadership of the Muslim world." In one chapter, Dayal describes "Oriental life in Berlin," paying special attention to Indians in Berlin; in another chapter, he describes the German presence in Asia -- Asian Minor and South Asia, primarily. The book ends with a criticism of the Kilafat movement, and praise towards British imperialism. Publisher: P.S. King & Son Ltd.